Corby Town slipped to a second successive defeat in the Evo-Stik League South Division One Central as a woeful display was duly rewarded with a 3-1 loss to Thame United at Steel Park. The Steelmen simply weren’t at the races for the majority of the afternoon and could have no arguments with the final outcome. They struggled to create an attacking threat and were poor defensively as Thame produced a decent all-round display to deservedly take all three points. There was little to write home about for long spells in the first half with Corby turning in one of their poorest 45 minutes of the season so far. They struggled to impose themselves on the game, gave possession away cheaply and, aside from Grouse having a couple of shots blocked, they failed to trouble the visiting defence. Thame were organised and knocked the ball around quite well but found it all-too easy to get in behind the Corby backline. Harry Scott did just that early on but failed to get a shot off while Liam Tack went close with an effort which sailed over the bar. But Thame did take a deserved leave five minutes before the break when another lapse in the home defence allowed Dan West to roll the ball home. Kinniburgh, no doubt furious with that first-half display, reacted with a double change at the break with Jake Bettles and Dean McBride coming on to replace Grouse and Ben Bradshaw. And while Corby started brightly after the restart, it was Thame who doubled their advantage six minutes into the second period. It was all-too simple as well as a ball over the top released Lynton Goss who raced away from a static backline and placed the ball under Dan George. It that was bad, it got a whole lot worse seven minutes later. 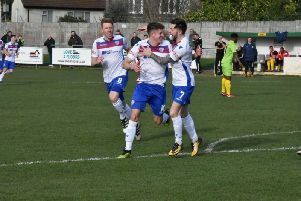 This time, after a set-piece had been cleared, the ball was recycled to Scott and his cross to the far post was headed home by the unmarked Jamie Essex. Corby finally registered their first attempt on target in the 70th minute when Sam Warburton - one of a few who could be satisfied with his personal efforts - saw his 30-yard free-kick held by Craig Hill. But what should have been a comfortable final few minutes for the visitors was made interesting when Aaron Jewell inexplicably wiped out Bettles in the corner with referee Daniel Robinson immediately brandishing a red card. Within two minutes, the Steelmen had a lifeline as West put through his own net after Warburton had driven a near undefendable ball across the face of goal. But, even with that goal and a numerical advantage, an onslaught in the latter stages never really materialised and, aside from Hill making a sharp save from Elliot Sandy’s low effort, Thame saw things out with few alarms. There haven’t been many days to forget for the Steelmen this season but this was certainly one them. There’s no need to panic after two defeats in a row but it must be put right next weekend before it becomes a major issue. Steelmen: George; Kennedy, Mulligan, Anton, Warburton; Bradshaw (sub McBride, h-t), Carta; Francis, Grouse (sub Bettles, h-t), Crawford; Sandy. Subs not used: Allen, Nkrumah, Ling. Thame: Hill; Mepham, Jewell, Essex, Lynn; Tack, Ashworth, Sturgess; Goss (sub Murray, 90 mins), West (sub Gledhill, 75 mins), Scott (sub Evans, 88 mins). Goals: West (40 mins, 0-1), Goss (51 mins, 0-2), Essex (58 mins, 0-3), West og (75 mins, 1-3). Sending-off: Jewell (serious foul play). Northants Telegraph man-of-the-match: Sam Warburton - slim pickings for this award after a poor display from the Steelmen. And while there were serious question marks over the defensive unit, the left-back did at least try to make things happen at the other end. He looked to be Corby’s best hope of creating anything and that was proven when he created their only goal of the afternoon. The best of a bad lot.